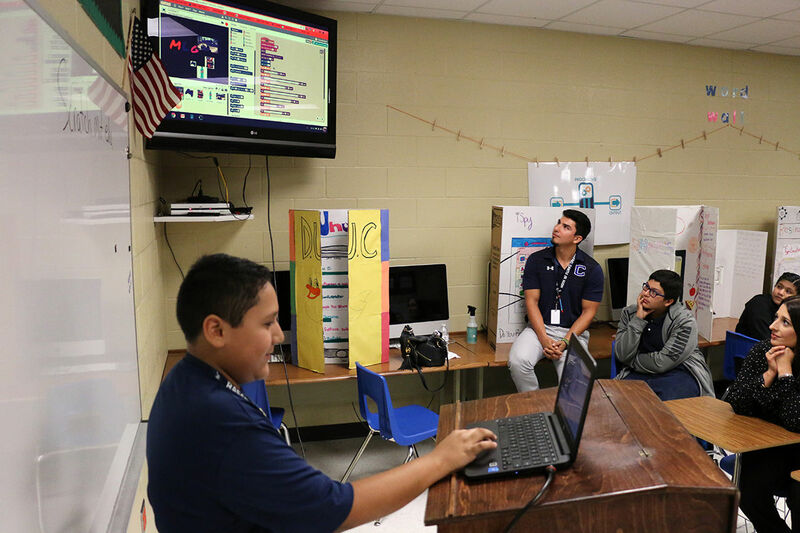 Juan Mendoza, student at R. Cantu Jr. High School presenting the coding portion of a program project. MISSION — Campuses throughout the Mission school district have begun a new initiative this year aimed at incorporating computer science into every subject. It is an effort to change the way students see the application of these skills. Like many other districts in the area, the Mission school district has coding courses, robotics and other STEM-related initiatives, but as Reyna said, now that teachers and students have been exposed to coding and what can be done with it, it is about how else they can implement that knowledge in the classrooms. To answer this question, the district partnered with the Mission Economic Development Corporation, which is sponsoring training sessions by the New York-based nonprofit Code/Interactive for teachers of every subject on how to include computer science into their classes. This could be, as Reyna explains it, by not only asking students to write a paper or a particular topic, but instead using coding to build an interactive presentation, just like his sixth-grade students did to create All About Me introductions using Scratch, a platform that allows students to program their own interactive presentations. Conversations with the district about the launch of the first district-wide initiative in the Rio Grande Valley began in November 2016, said Jules Baraford-Temel, program director for the region. Planning began this spring and the first cohort of teachers was trained during the summer with the help of Code/Interactive’s Tom O’Connell, vice president of programming and partnerships. The initiative not only impacts the student’s education, but also the professional development of teachers who are being trained to also think outside the box in order to incorporate new skills into the curriculum and better engage students. And because now most schools have teachers who focus solely on coding or computer science, they all get to work together to figure out how to implement the ideas, they said. While the initiative is now in effect only in middle and high schools, the plan is to continue to expand to reach elementary schools in coming years. So far the training has involved 16 elementary teachers, four middle school teachers and three high school teachers, O’Connor said, and the team is visiting classrooms to help them fully fold these skills into the curriculum. Computer science skills, he said, are essential not only for the future of students but for the current workforce, especially teachers who are the ones preparing those intended to fill in the workforce gaps along many fields. This is the reason why the Mission EDC decided to sponsor the initiative, said EDC Program Director Cristina Garza, as they considered the economic impact that a district-wide effort will have in the area. “We have a responsibility to equip the children of mission with the computer science skills that will provide them financial mobility as adults, and we have a responsibility to the city of Mission to take care of its economy by creating a generation of tech savvy citizens,” Garza said.